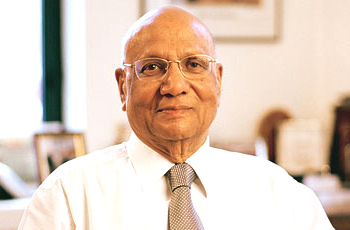 Swraj Paul , Baron Paul, was born in Punjab in 1931. He received his BSc, MSc and MechE degrees in mechanical engineering from the Massachusetts Institute of Technology (MIT) in the United States, and came to Britain in 1966. He received his peerage in October 1996, and has sat on a number of committees like European Union Committee and the Economic Affairs Committee. Lord Paul has taken an interest in international relations. He was appointed by the government to act as an ambassador for British business from 1998 -2010 and was a member of the Foreign Policy Centre Advisory Council. He also contested for the chairmanship of the Commonwealth Parliamentary Association, with an agenda to reduce the gap between the West and the East. In addition Lord Paul was also co-chairman of the Indo-British Roundtable from 2000-2005 and was a member of Panel 2000, an appointment by the Prime Minister to re-brand Britain. Alongside his many achievements, Lord Paul was also the first person from Indian origin to hold the post of Deputy Speaker of the House of Lords. He has received many awards for his outstanding achievements in the fields of industry, education and philanthropy, and was awarded 'International Indian of Decade' award at the 20th anniversary of the publication of India Link International. He is seen as one of the richest and most influential British industrialists, and although he has passed on his businesses to his sons, he still pushes his agenda of the importance of manufacturing industry to economic health.